Happy Friday, dear readers! This week has just flown by, and I am looking forward to the weekend! I don't have any special plans, but I am looking forward to sleeping in a little! I've been up later than usual with swatching, editing photos, and getting posts written up, and I could use a little self-imposed TLC. What better way to start than with a nice fragrance to lift the spirits! 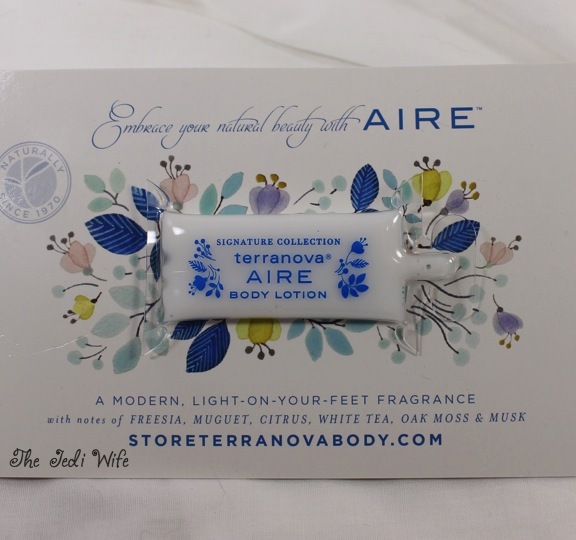 Today's blog post is on a product that will do just that: TerraNova Body products! I stopped at the TerraNova booth while at CPNA, and I was pleased to discover that the company is based close to my town. Owned and operated by two sisters, this small company prides itself in providing stellar service and personal care of its customers. As a consumer, I love supporting companies that strive to take care of me! While at the booth, I was given a sample of their Pikake Petal Soft Lotion. The scent is spot-on to the Hawaiian jasmine pikake flower. This light lotion absorbs quickly into the skin and includes the added benefit of green tea and vitamin E.
I also got a small sample of their body lotion in the new scent, Aire. It is very lightly scented and is perfect for people that like a touch of fragrance but nothing too heavy. The body lotion has a thicker formula than the petal soft lotion (like the Pikake shown above) and is ideal for drier skin and the drier weather that is quickly approaching. In addition to lotions, TerraNova Body has body wash, body oils, cologne mists, and soaps. From floral to tropical, light to musky, TerraNova has a scent that is sure to appeal to you! Have you used any products from TerraNova? I'd love your feedback! Very cool, I've never heard of this brand before! Aire's scent sounds perfect.